Although he was born in Chicago, Dr. Khan was raised on a farm in South Carolina where he learned early on how to proficiently use his hands. He later adopted the Houston, Texas area as his home and has lived in the Katy/Richmond area since 2010. After graduating as salutatorian of his high school, he completed his undergraduate courses at the prestigious Furman University in South Carolina with top honors and a degree in chemistry. 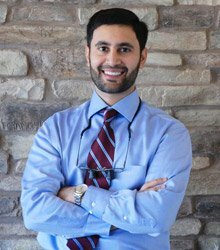 Dr. Rizwan Khan then attended dental school at the Medical University of South Carolina where, once again, he was a top graduate. Subsequent to dental school, Dr. Khan completed a multi-year residency in dentofacial orthopedics and orthodontics at the Medical University of South Carolina. He was honored as the sole winner of the 2007 Award of Excellence from the American Association of Orthodontists. Dr. Khan’s wife, Sophia, is a Katy, Texas native and a graduate of Texas A&M. They are the proud parents of two boys and are expecting their third soon. The family has made a home in Katy, TX and enjoys traveling outdoor activities, and family time. Dr. Rizwan Khan has dedicated himself to providing excellent orthodontic services to the people of the Katy, Richmond, and Sugar Land, Texas region. He offers only the highest quality orthodontic treatments to help ensure his patients receive the effective and efficient orthodontic solutions they deserve. To learn more about how Smile Studio Orthodontics can help you or your child, call us at (832) 535-1865.